In questa sezione troverete elementi di arredamento progettati a misura di bambino, costruiti con solido faggio massello e trattati con finiture atossiche. In this section you will find furnishing accessories with child-oriented design, made up of solid beechwood, with non-toxin finishing. 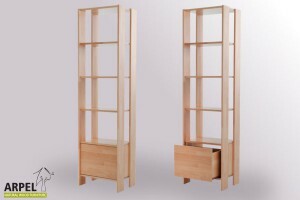 Solitar wardrobe provided with two doors with hinge,L-H-W 84x180x54cm; the price includes 1 shelf and a clothes hanger stick, the handles can be lather laces or steel knobs. 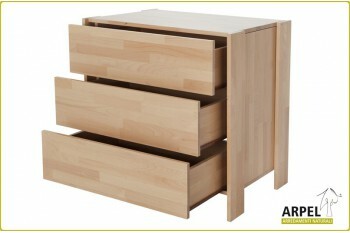 Jem chest of drawers with three drawers that move on metallic runners L-H-D 80x8x56 cm. TV console composed of two drawers and a glove compartment under the top, L-H-D cm 131x55x51. Empik bookcase with 4 shelves and a drawer at the bottom, L-H-D 50x158x37.